Definition of Native American Mythology: What is Native American Mythology? Native American Mythology is based on a collection of myths and legends of a people, concerning the origin of the people (creation myth), the nature of the universe, deities, ancestors and heroes. The stories, legends and myths that formed the basis of Native American Mythology varied between locations - different tribes had different myths and beliefs. The Native Americans do not share a single, combined body of mythology. The many different tribes each developed their own stories and legends about the creation of the world, the appearance of the first people and the lives and deeds of deities and heroes. 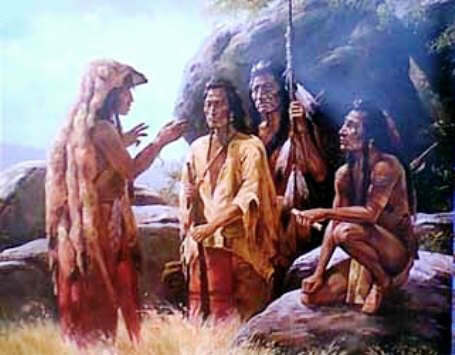 There were, however, some shared beliefs in the mythology of the Indians, notably Animism and Nature Worship. Animists believe that souls or spirits exist, not only in humans, but also in animals, plants, trees, rocks and all natural forces and and phenomena such as the rain, sun and moon. The idea of animism is probably one of the oldest beliefs of man, with its origins probably dating back to the Stone Age and was commonly applied to hunter gatherer groups. Underlying all the myths and legends in Native American mythology is the idea that spiritual forces inhabited all living things, both animate, such as the animals and inanimate, such as rocks, plants and mountains. Native American Mythology, legends, religion, history, and ritual were not separate elements. They were all woven together in the various legends, myths and stories that defined the identity of a tribe and gave order and meaning to their lives. Despite the vast number of Native American myths, stories and legends, certain themes occur repeatedly. One of the key concepts of Native American mythology is creation. The most important components of Native American Mythology therefore related to how the creator gods created the universe and the origins of man, the earth, the animals, food, death and the afterlife. The names of the creators or supreme beings that feature in Native American Mythology vary considerably between Indian tribes however the high deity, the Creator referred to as the Great Spirit, feature in many creation myths, as do the deities known as Mother Earth and Father Sky. Other creation myths refer to principal deities such as Spider Woman in the mythology of the Hopi, Napi in the mythology of the Blackfoot, Tirawa in the mythology of the Pawnee and Wakan Tanka in the mythology of the Sioux. Among the Zuni, the supreme creator is Awonawilona, the sun god. These supreme beings then passed the the everyday running of the world to lesser deities an spirits. The secondary deities are often personifications of natural forces, such as the wind. In Native American Mythology the secondary deities and spirits are often personifications of animals or natural forces, such as the wind. Native American mythology contains many deities and spirits including Tricksters, transformers or shape shifters, Kachinas, heroes and supernatural mythical creatures. Many of the lesser deities, such as the Navajo Yei Spirit, mediate between humans and the Great Spirit. Others restore order in the world and have the role of teachers to the people. The lesser deities and spirits of Native American Mythology have both negative and positive qualities - they can be destructive, malevolent and unpredictable or helpful, benign or comical. In Native American Mythology many deities and spirits have different roles and characteristics. Tricksters figure in the myths and legends of most Native Indian tribes and are often identified with specific animals. Tricksters or clowns are mischievous supernatural beings who take the form of animals. Common trickster figures in Native American mythology include Coyote and Spider in the Plains and the Southwest regions, Rabbit in the Eastern regions and Raven in the tribes of the Northwest. Other figures who feature in Native American Mythology are twins and hero figures. Twins generally have opposing characters or qualities and represent duality - good versus evil, right versus wrong. Twins are used in many myths and legends in morality tales. Heroes are beings of great strength and courage celebrated for bold exploits. The heroes featured in Native American Mythology are often the offspring of a god. The hero figures are seen as protectors of the people who kill monsters and battle against evil spirits. The Hero figures who feature in Native American Mythology are often teachers passing on various kills in healing and arts and crafts. The supernatural mythical creatures in Native American Mythology included beasts and monsters such as Horned Serpents or the Avanyu, the Thunderbird, Kokopelli and the Piasa Bird.